Top Boutique Investment Banks – A boutique investment bank is conceptually different than any other investment banks. Boutique investment banks usually work on small deals. They work with mid-market companies whose revenues are within the range of a billion dollars. Most boutique investment bank specializes on one of the aspects of capital raising, restructuring, mergers and acquisitions, reorganizations and corporate finance. It is being seen that a lot of corporates are hiring boutique investment banks to ease up their financial troubles. The reasons for hiring boutique investment banks over others are the skilled individuals (more than one), no chance of conflicts and being able to be independent irrespective of receiving support from the boutique investments banks. 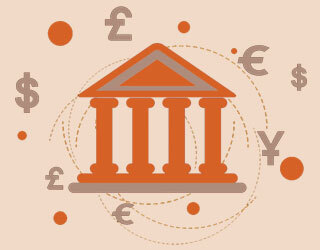 In this article we will discuss about top boutique investment banks in the world. We will see briefly about each of them and what services they provide. Let’s get started right away. 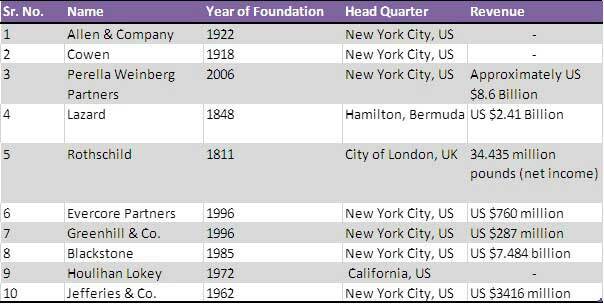 Let us now look at the details of these Top Boutique Investment Banks. Bank Services: Allen & Company is an American privately held Investment banking boutique firm which specializes in media and entertainment sectors. It was founded by Charles Robert Allen, Jr. After sometime, his brother Herbert A. Allen, Sr. and Harold Allen joined in. Now the CEO of Allen & Company is Herbert A. Allen, Jr. who shies away from public; thus doesn’t maintain his own website. There are four major events in the history of Allen & Company and their dealings which should be mentioned. In 1973, a stake of Columbia Pictures was bought by Allen & Co. Later in 1982, the business was sold to Coca-Cola which made Allen & Co. significant profit as well as Herbert A. Allen, Jr. has ensured a place in the board of directors of Coca-Cola. In 2004, during the Google initial offering, Allen & Co. was one of the ten underwriters. In 2013, Allen & Co. was also one of the seven underwriters on the initial offering of Twitter Inc. In February, 2014, when Facebook acquired Whatsapp in US $19 billion, Allen & Co. was Facebook’s advisor. Office culture/career: The office culture was quite dynamic in Allen & Co., as people from all walks of life has joined Allan & Co. From ex-governor of Nebraska to former director of CIA and also legendary people from baseball and basketball joined Allen & Co. It’s quite obvious that Allen & Co. thrives on new ideas from all walks of people and visualizes its current existence as far enriching boutique investment bank than it was before. Strength/weakness: The major strength of Allen & Co. is personal relationships. And this is the key to its success. Allen & Co. continually draws upon people like Bill Gates, Warren Buffett, Oprah Winfrey, Donald Keough etc. Bank Services: Cowen Group is a diversified financial services firm which provides alternative investment management, research, investment banking. It has two business segments – one is Ramius LLC which provides alternative asset management solutions to global clients and another is Cowen and Company, LLC which deals with broker-dealer segment. Cowen Group focuses on a lot of sectors. Aerospace & Defence, Healthcare, IT Services, Real Estates are few of them. Office culture/career: Cowen Group is one of the smartest places to work in. They attract only the best talent who can deliver in their two primary business groups. They value human capital more than anything else and they understand how helping to achieve individual goals help shape the organizational vision. Cowen group also encourages diversity in work place and they also emphasize wellness at workplace. Strength/Weakness: Cowen group is the go to bank for every investor who wants to thrive in their businesses. As Cowen group is a diversified boutique investment bank, providing services in so many sectors, they are chosen over any other banks in diversified businesses. But there is a weakness of this strength. As they focus on too many sectors, the focus on each sector may often spread thin and lose quality of the service. Bank Services: Perella Weinberg Partners is a newer firm compared to its other counterparts. It protrudes its motto as “solving the unsolvable” and delivers results. The prime focus of this world class boutique investment banking firm is on few areas namely – M&A, financial restructuring, strategic advisory, private capital advisory and capital structure advisory. Three of the most lucrative transactions of Perella Weinberg Partners are with Deutsche Borse AG, Sunoco LP and Deutsche Wohnen AG. All the deals are of more than few billion euros. Firm’s main business focus is on complete client satisfaction; thus provides amazing customer centric services. Office culture/career: With proper care in building individuality as well as the culture of the organization, Perella Weinberg Partners thrive in the moment of crisis. They aim to face the challenges with multi-dimensional approach and exception efficiency in what they deliver. Thus they recruit people who are ambitious, love challenges and will go the extra mile to make things happen. Strength/Weakness: The strength of this firm is its uniqueness and customer centric approach to deal with investors’ issues. In firm’s advisory board, all the top people of the world are recruited – from former Chairman and CEO of Nokia to Chairman, IHS Cambridge Energy Research Associates etc. The major weakness of the firm is that it is comparatively newer than its counterparts which may create some challenges due to inexperience. Bank Services: Lazard is one of the oldest and best investment boutique firms in the world. It has been serving its clients for more than 167 years. Lazard emphasizes financial advisory and asset management. In financial advisory, they service in M&A, capital structuring, capital raising and restructuring. Their belief is that clients come back to us knowing well that what they can deliver wouldn’t be otherwise possible for anyone else in the similar domain of expertise. Office culture/career: The culture of Lazard is diversified. It serves in more than 40 countries and it has 42 offices worldwide. It has its employees from more than 70 plus countries which is the proof of how Lazard has become an encourager of diversity in the office culture. Moreover, Lazard values individual contributions as well as overall outcome which help Lazard maintain the organizational alignment between its employees and its vision. Strength/Weakness: The major strength of this firm is the tradition and values it hones over the years. It connects the history of the financial advisory and helps them see a big picture better than anyone else in the industry. Quite often than not, when they think themselves best of the best with all the years of experience, there is a chance of complacency. Office culture/career: Rothschild is a global firm. They employ people from more than 40 countries and around 2800 people from all these 40 countries work here. Their culture concentrates on inclusiveness which has been realized by very few firms on earth. Organizations talk about diversified human capital; but being inclusive is very strategic and enlightened move. Strength/Weakness: Rothschild is not only a firm which supports individuals in handling their financial transactions, but it has supported 335 charities hitherto. Rothschild has a specialist team for small, complex transactions; but they are not as good in handling large projects as they are in small deals. Banking services: Evercore Partners mainly has two services to offer – first is investment banking advisory services which is over $2 trillion in announced transactions and includes divestitures and restructurings, mergers and acquisitions, financings, public offerings etc. ; another is investment management services which is over $8 billion in assets under management and includes institutional asset management, private equity funds management etc. Office culture/career: The core values of Encore Partners are excellence, experience, integrity and independence. Mainly they hire employees from USA and Europe. Strength/weakness: The major strength of Encore Partners is its incredible repute of execution, whereas it cannot be called a global business as it hires mainly from Europe and USA. Bank services: Greenhill & Co. provides services for big as well as small deals. It generally serves in the areas of mergers and acquisitions, financing and restructuring and capital advisory. The sectors where Grennhill & Co. serves are industrial, financial services, energy, utilities and infrastructure, technology etc. Office culture/career: Since its inception in 1996, it has been maintaining top class human resources to serve its clients better. They pride themselves with attracting best employees and maintaining a collegial (i.e. shared responsibility) culture. Strength/Weakness: Their major strength is that they handle clients from Japan to USA and the deals also vary from $100 million to billion dollars deals. One of the things they can improve is to tap into the developing country which they are yet to explore. Bank services: Blackstone is one of the most premiere boutique firms in the world. They provide services in private equity, real estate, hedge fund solutions (BAAM) and credit (GSO). Their philosophy revolves around the art of long view. Office culture/career: Blackstone is really a global organization which attracts employees from all over the world. Not only that, they also serve clients all over the world. They help secure benefits for 29 million pensioners only in US; and millions internationally. During their 30 years of existence in the industry, they have always delivered magnificent results. Strength/Weakness: The major part of working in Blackstone is that you can always grow and get better as they conduct many programs and workshops for women, veterans and experienced people. Bank services: Houlihan Lokey offers various services. Mainly they provide services in Corporate Finance (Mergers & Acquisitions, Capital Markets & Illiquid Financial Asset Practice), Financial Advisory Services (Transaction Opinions, Transaction Advisory Services, Tax & Financial Reporting valuation, Portfolio Valuation & Advisory, Real Estate Valuation & Advisory and Financial Consulting) and Financial Restructuring (Distressed Mergers & Acquisitions and Special Situations). Office culture/career: Houlihan Lokey looks for excellence and they aim to achieve that in their employees. Thus they hire people who have only one trait – a drive for excellence. They are the number one bank in satisfaction, firm culture, international opportunities and promotion policies. Strength/Weakness: They are excellent employer to work with, but as they focus on too many sectors, their focus may spread thin. But overall they believe in delivering excellence. Bank services: Jefferies & Co. are one of the most premiere investment banks in the world. They provide services in Debt Capital Markets, Equity Capital Markets, Mergers & Acquisitions, Private Capital Advisory, Restructuring & Recapitalization etc. Office culture/career: Jefferies & Co. boasts of their equal opportunity culture and they employ people from various backgrounds, having diversified degrees and qualifications. According to the HITC Business, Jefferies & Co. is the best place to work in the decade. They have also designed employee benefits program which takes care of employees’ insurance, helps in family planning and organizes wellness programs.